Go to that role’s manage rights form, and then, in the top right corner of the form, click DELETE. This action opens the Delete Role form. Note: You cannot delete the default EXTERNAL USER role. 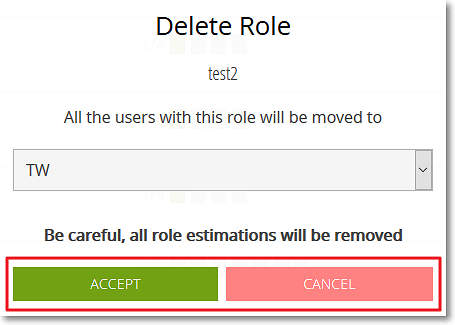 On the Delete Role form, select the role that will be automatically assigned to the members that currently have the role that you are about to delete. To do this, click the box that displays the currently selected role and then select another role from the list or continue with the current selection. To close the Delete Role form and delete the role from the current project, click ACCEPT; to close the form without deleting the role, click CANCEL. All members that had the role you deleted will now have the role you selected on step 2. Note: Any estimations done by members with the role that you have just deleted are also removed.